This is a real Spanish villa! 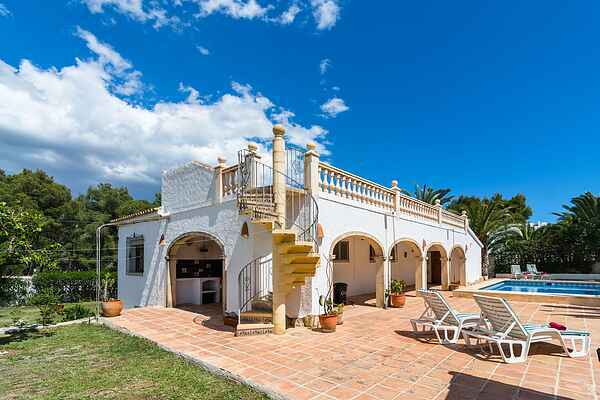 Located in the peaceful neighborhood Pinar de L'Avocat, 2 km from the centre of the cute city of Moraira. This vacation home, completely on the ground floor with a comfortable and tidy interior is exactly what you are looking for. The beautiful white wall and arching passageways are distinctively spanish and give the house character. In the living room there's a lazy seating area and a cosy fireplace, allthough you probably won't need it! During the day you can tan (don't forget to use sunscreen) on one of the lounging chairs by the private pool with outdoor shower, or on the large rooftop terrace with marvelous view on the sea. The beautiful and fully enclosed garden with palm tree and beautiful bougainvilles gives you plenty of places in the shade and the kids can play on the huge lawn to their heart's desire. The grocery store is 1.5 km away. However you will leave this lovely vacation spot for a relaxing day on the beach of Ampolla (2 km). Moraira has besides many conveniences a pleasant night life, for a cultural trip you can go to Altea (25 km). If you some sportsy variation, you can go play some tennis at the tennis court or hit a ball on the 9-holes golf course (1,5 km).